All work and no play makes Jack a dull boy on yhdysvaltalaisen kirjailijan John Daniel "Jack" Torrancen postuumisti ilmestynyt mestariteos. Se jäi hänen viimeiseksi kirjoitustyökseen. Teoksen käänsi tuoreeltaan suomen kielelle Pentti Saarikoski nimellä Kaikki työskentely eikä lainkaan vallankumousta himmentää Penan, joskin suomennoksen luotettavuudesta on kiistelty. All work and no play makes Jack a dull boy. All work and no play makes Jack a dull boy. All work and no play makes Jack a dull boy. work and no play makes Jack a dull boy. Jack a dull boy. All work and no play makes Jack a dull boy. All work and no play makes Jack a dull boy.All work and no play makes Jack a dull boy.All work and no play makes Jack a dull boy.All work and no play makes Jack a dull boy. All work and no play makes Jack a dull boy? All work and no play makes Jack a dull boy. All work and no play makes Jack a dull boy. All work and no play makes Jack a dull boy. All work and no play makes Jack a dull boy. All work and no play makes Jack a dull boy. All work and no play makes Jack a dull boy. All work and no play makes Jack a dull boy. All work and no play makes Jack a dull boy. All work and no play makes Jack a dull boy. All work and no play makes Jack a dull boy. All work and no play makes Jack a dull boy. All work and no play makes Jack a dull boy. All work and no play makes Jack a dull boy. All work and no play makes Jack a dull boy. All work and no play makes Jack a dull boy. All work and no play makes Jack a dull boy. All work and no play makes Jack a dull boy. All work and no play makes Jack a dull boy. All work and no play makes Jack a dull boy. All work and no play makes Jack a dull boy. All work and no play makes Jack a dull boy. All work and no play makes Jack a dull boy. All work and no play makes Jack a dull boy. All work and no play makes Jack a dull boy. All work and no play makes Jack a dull boy. All work and no play makes Jack a dull boy. All work and no play makes Jack a dull boy. All work and no play makes Jack a dull boy. All work and no play makes Jack a dull boy. All work and no play makes Jack a dull boy. All work and no play makes Jack a dull boy. All work and no play makes Jack a dull boy. All work and no play makes Jack a dull boy. All work and no play makes Jack a dull boy. All work and no play makes Jack a dull boy. All work and no play makes Jack a dull boy. 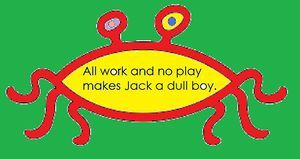 All play and no work makes Jack poor. All wrok and no play makes Jack a dull boy. All work and no play makes Jack a dull boy. All work and no play makes Jack a dull boy. All work and no play makes Jack a dull boy. All work and no play makes Jack a dull boy. All work and no play makes Jack a dull boy. All work and no play makes Jack a dull boy. All work and no play makes Jack a dull boy. All work and no play makes Jack a dull boy. Kirja on filmattu ainakin kahdesti; Stanley Kubrick ja Stephen King ovat tehneet siitä omat versionsa. Kingin teelmää syytetään yliluonnollisten ainesten lisäämistä kertomukseen (oikeastaan hänen tavaramerkkinsä). Jack Torrancella oli vaimo ja poika. Hänet löydettiin kuoliaaksi jäätyneenä Overlook-hotellin sokkelosta, johon hän epäilemättä eksyi lumimyrskyssä. Sivua on viimeksi muutettu 30. joulukuuta 2018 kello 18.55.